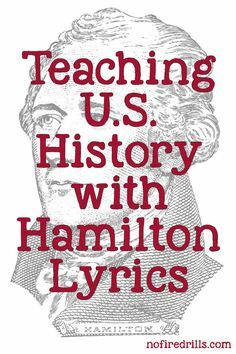 Teach Hamilton (the Musical) In the Classroom - Be your best teacher! Many moons ago (2009 to be exact), before Hamilton was a big hit on Broadway, Lin Manuel Miranda presented a rap song to President Obama at the White House Poetry Jam. It was funny, fresh and historically accurate – in other words PERFECT for my US history class to view. They were hooked, students wanted MORE Hamilton… (Little did they know they were in for a round of Oklahoma shortly thereafter). As the years went on I joshed to my students, “Oh, they are supposed to make this into a Broadway show some day, maybe you will get tickets to see it once you graduate”. Little did WE know that this was going to be the biggest musical hit of our generation! I have had so many students have email me over the past year asking “WERE YOU IN THE ROOM WHERE IT HAPPENS? !” aka, “DID YOU GET HAMILTON TICKETS YET? !” The answer, yes…. I was one of the lucky ones. I was not giving away My Shot. In fact, I tried every day when it played at the Public Theatre to no avail. But once it was released on Broadway I bought tickets for the first week (6 months out of course). Opening week, there I was, mouthing every word to the opening song “Hamilton”. I was obsessed. I knew I had to bring more of the play into my classroom. Previously, when I taught the topic of the early Colonial Period and the American Revolution, I did a painting analysis of John Trumbell’s Revolutionary War paintings. BUT… when the play came out I created more curriculum to bring in lyrics from the play. My recommendation is to print out lyrics for students to underline, then analyze as you listen to the music. Obviously, the first song “Hamilton” is the hook. Have students review the lyrics. Infer – what was the immigrant experience like in the 1700s? Can you draw any parallels to today? Can any of you relate to Hamilton? Why? How can we differentiate between the Loyalists/Tories and Fence sitters during the American Revolution? Which side would you be on and why? How did political parties emerge during the Washington administration? Was Hamilton’s Financial/ Assumption Plan a wise plan for the nation? Two Georges (Washington & George III). One a king, one a president. Which George led better and why? Why was there a second war of Independence? Synthesis Extension: Hamilton the Musical (American Revolution) vs. Les Miserables (French Revolution). Why did the colonies win the American Revolution? Should the US supported the French during their revolution? What were women’s roles during the American Revolution? Why was the word woman missing from the Declaration of Independence? Did Washington make the right decision in resigning? What words of wisdom did Washington leave for the country? Did Adams “Mr. Rotundity” do the 2nd Administration justice during his tenure? Was a peaceful transfer of power possible during the election of 1800? How did Hamilton’s letter contribute to Hamilton’s final fate (the Duel with Burr)? Who are the Hamiltonians and the Jeffersonians in politics today? What will your “shot be? !” What will history write about you? Will you be in the room where it happens? Why? 2) YOU MUST! MUST! MUST! Show your students the Got Milk Commercial to wrap up the Unit! Happy Hamming It up in your classrooms! Previous Post Make Your Presentations Interactive! Next Post Use an avatar in the classroom and for Parent Teacher Conferences! Amazing lesson ideas!! Now I really want to be in the room where it happens! I teach middle school and next year US History will be 6th grade. How did you get around the curse words? Hi Kim! Thanks so much for your question. There are two ways to get around this. One, tell parents the music is explicit and have students bring back signed parental slips. The second is when you are making copies of the lyrics skip the curse words. Thats what I usually do, I print it with spaces. I hope that helps! Feel free to reach out with any additional questions. Do you by any chance have this more easily downloadable? I want to use this next week with my 8th graders! I LOVE what you’ve done here! I have so many kids who are flipped out as soon as they saw Hamilton in their reading! I LOVE THIS! Do you know of any websites that play a censored version of the songs? If any of you are interested, I have assignments that I have created based on “What Comes Next?” and “You’ll Be Back” that I use in my classroom. If you want the assignment, just send me an email at the address below.